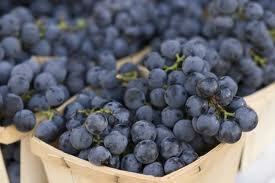 Concord grapes. They come only in the fall and they cannot be forgotten. They are the definitive sweet grape flavor. They also have skins you could make a tire from. Or, a great, great syrup. Look, it is fall. The kids are returning to school and each weekday morning is a madhouse. Parents scrambling to get the kids to school by foot, bike or bus and then be off to your own jobs. Those kids are often scrambling too, hoping to stay home or just pick one more fight with a sibling. And everybody is hungry. Now, I have never eaten a frozen, pre-made waffle. But people do, and I understand. If you are in that fast food lane, but want to send your kid or your spouse off with something special, then adorn that waffle with some wonderful syrup. Not store bought. Not maple. This is universal syrup with a very intense flavor. We actually served it last night on watermelon granita, a red on red flavor powerhouse. Now, about those grape skins. The original recipe calls for using a blender. We did. But it was a Vitamix, that very powerful blender you see in places like Jamba Juice. The Vitamix is able to truly pulverize the tough skins of the concord grapes, the exact place where so much nutrition and flavor is stored. The Vitamix simply outclasses a conventional blender here. So, next time you look at one at your cooking store, really, really consider getting your own Vitamix. They are incredible machines. As a point of full disclosure, we have four of the Vitamixes here, donated by the company. We use them regularly and we could never, never go back. And finally, about those frozen waffles. I have this corn waffle recipe that I’ll be testing this week. Since it, too comes from I Love Corn, I have high expectations. Pull the grapes off the stems and place is a blender, ideally a Vitamix. Puree for at least one minute. In the Vitamix, you’ll hear the grape seeds smacking the sides of the container and then gradually the sound will dissipate. Those seeds, with important anti-oxidants, are being ground up to be healthfully enjoyed. Strain the liquid through a sieve, pressing to get as much juice out as possible. Put the juice, the sugar, and the lemon juice in a medium sauce pan and stir to mix. On medium-low heat, cook uncovered until the mixture is simmering, while stirring occasionally. Continue to cook, stirring occasionally, until the mixture reduces to a syrupy consistency. Cool to room temperature. Refrigerate in a glass container. Use within two weeks. Why so much sugar? My concords are so sweet that adding sugar makes the mixture too sweet. I have a sweet tooth. I suspect that this dish could be made with less sugar, but this recipe was super delicious. Grape sweetness depends on the summer sun and this year has been, to put it mildly, strange. I hope you enjoy each of your grapes. I wish we could have concords year round.